Camping with a newborn: forging his future, or just plain nuts? Will Baby keep warm? Will the forest imprint on his consciousness? Will Dad’s love affair with the woods continue? Or will everybody end up crying? It had the potential to be the dumbest idea a new parent could have. When I learned my wife and I were having our first baby, one of my biggest fears was that my outdoor life would come to a screeching halt. I’d seen plenty of friends who stopped having adventures the minute their babies came on the scene. My eagerness to take Ian camping so early in life was a desperate attempt to prove my favorite hobby wouldn’t end just because we had a baby in tow. 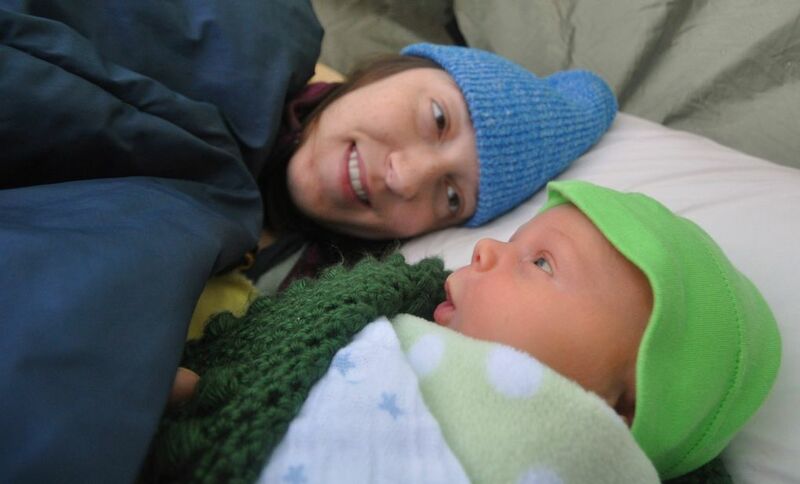 Maybe camping with a newborn would actually add a new angle to the wonder of camping — at least that was my hope. So last September, two bewildered parents and a bundled-up newborn piled into the car and headed to a riverside campsite along the Mountain Loop Highway. Our chances for success — for actually staying the entire night in nature? About 50-50, we agreed. But there was only one way to find out. Eat, sleep, poop and cry. That’s your life when you’re a new parent. It’s a constant revolving cycle of care. As it turns out, those four things happen no matter whether you’re surrounded by the comforts of home or camping in the wilderness. Newborns are too young to rely on routines — things change so much from day to day, and Ian didn’t seem to understand the difference between getting fed or changed in a nursery or in a tent. On the other hand, watching him interact with his environment was fascinating. Babies love strong contrasts between dark and light shapes. In nature there are plenty of things like mountains and snowfields to stare at. He was mesmerized for hours by the gentle sway of evergreen trees against the bright-blue summer sky, or the vivid green moss growing on a stark white boulder. As the low angled afternoon light cut through the forest lining the Stillaguamish River, we found warm sunny spots and made a bed of smooth stones and blankets. We laid him down for naps on the riverbank like a baby Moses, letting the white noise of the moving water lull him to sleep. But it was careful work for two nervous parents to protect his porcelain skin from sunburn and maintain enough insulation against the crisp chill in the air. Keeping Ian warm was our biggest challenge during the outing. As afternoon turned to evening, the river sucked warmth from the valley. 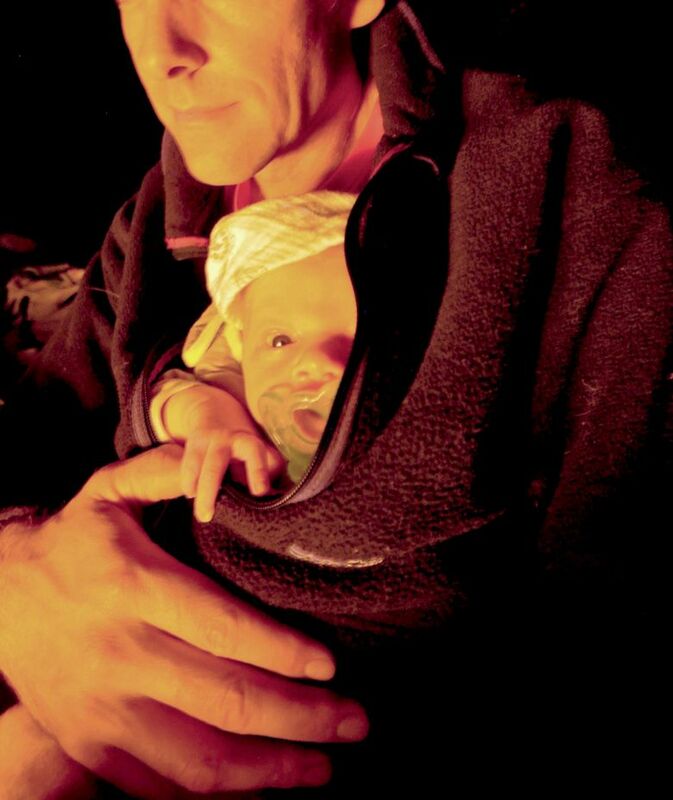 We lit a campfire and stuffed Ian inside our puffy down jackets to keep him toasty warm. His eyes grew heavy as he burrowed ever deeper into our jackets, happy for our closeness and mesmerized by the novel experience of his first campfire as it shot rocketing sparks into the night. Sleeping on an air mattress next to such a fragile little creature was both exhilarating and terrifying. As rookie parents, we were still learning the ropes for putting a baby to bed at night. Adding new elements like sleeping on the ground caused us no small level of anxiety. How many layers should we bundle? What if he screamed all night? What if a sleeping bag accidentally slid over his face? We soon learned that when Ian was warm enough, he slept fine. When he wasn’t he told us. Our baby Houdini worked his little hands free of his swaddle, and his chilly fingers were heartbreaking for my wife. So within a few hours, we tucked Ian between us in our nest of sleeping bags, and mother and son slept soundly from then on. The following morning proved to be my favorite moment of our camping trip if not his entire life to date. As a dad, it is brief moments like these that melt your heart and make you realize that the whole crazy parent thing is going to be absolutely worth it in the end. Perhaps Ian’s 16-day-old baby brain was too young to contemplate “indoors” versus “outdoors.” But I like to think the sound of the river and the clear mountain air were forging strong connections to the Pacific Northwest. Even if Ian decides to live in another part of the world later in life, I find myself hoping that he will have an inexplicable salmon-like instinct to swim back home. As I watched him in the natural world, I decided that it’s never too early to help him forge those connections. Ian surely won’t remember his first camping trip. And even if he doesn’t become a little outdoorsman as a result, I’m glad we got a jump-start on spending time in nature together. In many ways, packing for a newborn is easier than packing for older children. We were surprised at how little we needed. In addition to our normal car-camping supplies, we brought one small duffle bag for Ian’s needs. The most critical element is sleep, because if kids are cold, everyone is going to be miserable. Dress babies in multiple layers and swaddle cloth that you can add and subtract as needed. An extra sleeping pad will help insulate them against ground cold. We normally use cloth diapers but opted for disposables to ensure Ian wouldn’t soak through his clothes and we could cut down on outfits. A camping chair will keep nursing mothers a lot more comfortable. Also helpful is a sling or front pack that will allow you to hike together and share body warmth when around the campfire. Seattle-based writer and photographer Jeff Layton writes about overseas travels and outdoor adventures with his newborn son on his blog, MarriedToAdventure.com. Seattle-based writer and photographer Jeff Layton writes about overseas travels and outdoor adventures with his newborn son on his blog .